Some of you may know me, and know that I am quite into WPF, some of you may even be into WPF yourselves and come to my blog to see what posts I have here to do with WPF. Well I just released a new article all about Aspect Orientated Programming (AOP). Now as a WPF developer I use the INotifyPropertyChanged interface (INPC) an awful lot. I have to say a lot of the time I am merely checking the new value does not equal current value and then calling the INotifyPropertyChanged interfaces PropertyChanged event. Not all the time mind, there are cases where something different happens in the setterâ€¦.but 80% of it is bulk standard, check property and call PropertyChanged changed event. Now I got thinking if we could use AOP to come up with something like this, where we use some special attribute to mark standard auto properties as INPC, where the AOP framework would fire the INPC PropertyChanged event whenever a property marked up with one of these attributes was set. Turned out to be way wrong, you can clearly see that the screen shot below which uses the standard ContextMenu with no additional styling has a ScrollViewer to present items that do not fit in a certain amount of space. There clearly is no ScrollViewer in the Microsoft example shown above. So I thought ok, so I need to Style a ContextMenu myself, fine. How I would normally tackle this in Expression Blend is to place some control on the work surface, right click, and just choose to edit the current Template. This is shown below, where I will edit a Button Template. Next I look at the selected Grid (â€œLayoutRootâ€) properties, and I find its ContextMenu property, which is under the Miscellaneous group. Now you can expand the ContextMenu as I have above, and scrolldown until you find the ContextMenu Style property. Ok so that is what the ContextMenu looks like by default. But what I wanted to do was swap out the standard look and feel of the ContextMenu (not the MenuItem controls they are styled separately), and the look of the Up/Down arrows it obviously has in its Template. So how about that then. So all that I really need to do then was create a new Style for the ScrollViewer using that ComponentResourceKey, which I did and here is all the relevant XAML for that. At work at the moment I am working on a large financial LOB app using WPF, where we regularly present the users with various information, some of which they can enter, and some of which they can not. Now as you can imagine some of this data comes from a database, and as such database ID columns (Primary key values to be precise) are presented to the users. Now these IDs are highly important to our users (who just happen to be internal users within my company), but are obviously read only and database generated, and can grow quite large, as we have a lot of records of certain types of entities. All following me so far I hope, well now we get to it, in an ideal world everything just works and no one cares about these IDs, and everyone goes about their business. But we are in the process of gradually improving this software (we do Agile iterations of improvements) so things change and occasionally things do go wrong, or do not work as expected, and our users generally relay this to us using the JIRA bug tracking software, where they can place screen shots, if they remember, or catch a problem in time, which quite often is not the case. So on of those occasions where they do manage to get a screen shot and log it in JIRA that is extremely helpful, but when they do not, guess what is the most important bit of information they can give us. Thatâ€™s right we need to know the ID of they thing they were trying to take an action on, and obviously the type of thing they were trying to do at the time the problem occurred. Ok it might be logged, but it could have been an unlogged thing, we have not managed to foresee. Now as I also mentioned these IDâ€™s can get rather long, and its all too easy to write down the wrong number. I also mentioned that these IDâ€™s are read only, so they are suited to Label type controls. Problem with using Labels is that the user is unable to copy from them. Sounds a bit rubbish, we could use a ReadOnly TextBox but it just looks a bit naff, looks quite like a normal TextBox, which some users canâ€™t see as being ReadOnly. So what else can we do, well luckily with WPF we can simply create a TextBox style that makes a ReadOnly TextBox look like a Label, which now allows Copy into an email (say). Now everyone is happy, we get the right ID sent to our JIRA bug tracking system, or an email, the UI still looks nice, and the TextBox is copy enabled. 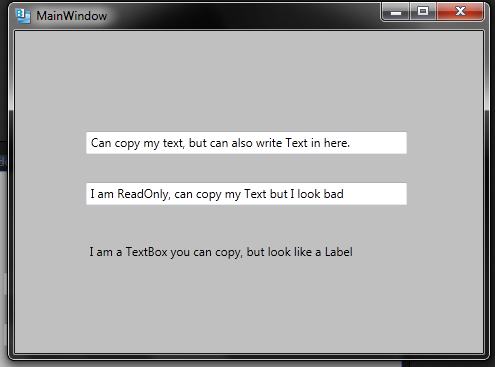 Here is the Style to make a ReadOnly TextBox look like a Label, that still allows copying from. This post is not rocket science, but it may be useful to people that have similar requirements to me I hope. Ok everyone, this is hopefully it my last Cinch posting, then back to some other stuff for me. I have this weekend made the following enhancements, and they were enhancements there was nothing wrong with codebase prior to this, but they were good ideas people gave me so I included them. Altered Cinch V2 DataWrapper the same way as I did for V1 above. Added a Non mandatory extra event to WorkSpaceData that can be used to cancel a closing of a workspace. Revised WPF demo to show this for ImageLoader workspace and left About workspace as it was to show it is not mandatory.